Just a few months ago, the graduates of BEST Corp’s first hospitality pre-apprenticeship program were strangers with one thing in common: They all knew they wanted more. Nicole Bowes had just moved back to Boston after 20 years away and needed to find work in a changed landscape. Victor Akaraka didn’t want to tread water in his dead-end restaurant job; he wanted to advance in his new country. Toryn Chambers, who’d had trouble finding work, was inspired to hear of a BEST Corp grad who made good wages and loved his job. 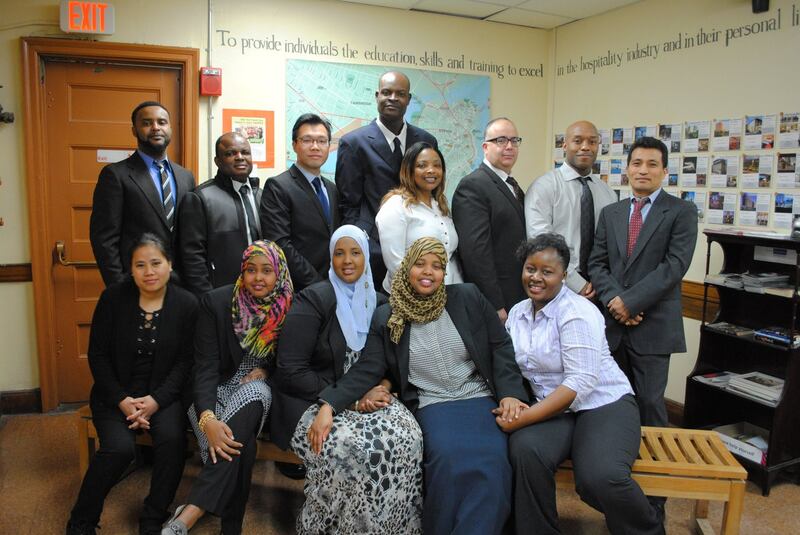 The first graduating class of the BEST Corp hospitality pre-apprenticeship program. At their Friday, April 1 graduation ceremony, Nicole, Victor, Toryn and their classmates took a significant step toward their goals. The ceremony marked their completion of the first phase in a larger apprenticeship program designed to create educational and career opportunities for residents who need them most. The Greater Boston American Apprenticeship Initiative, spearheaded by the Mayor’s Office of Workforce Development (OWD), is a 5-year, coordinated effort among construction and hospitality apprenticeship programs, labor unions, and area colleges to provide career pathways for low-income applicants. BEST Corp, a non-profit that has trained hospitality workers at its Chinatown training center for roughly a decade, oversees the hospitality side of the initiative. In its pre-apprenticeship program, BEST Corp trains participants in housekeeping, then helps place graduates in apprenticeships with local hotels. In union apprenticeships, participants earn initial wages of $16 per hour and can work toward journeyman wages of $21 per hour. In her remarks to graduates, OWD Director Trinh Nguyen underscored the moral imperative that city workers share in the benefits of Boston’s boomtime prosperity. “Frankly, it’s uncivilized to build these beautiful glass buildings, but the people cleaning the bathrooms and the floors don’t make enough for their families – to build their careers or save for their future,” she said. Graduate Victor Akaraka practices his smile. 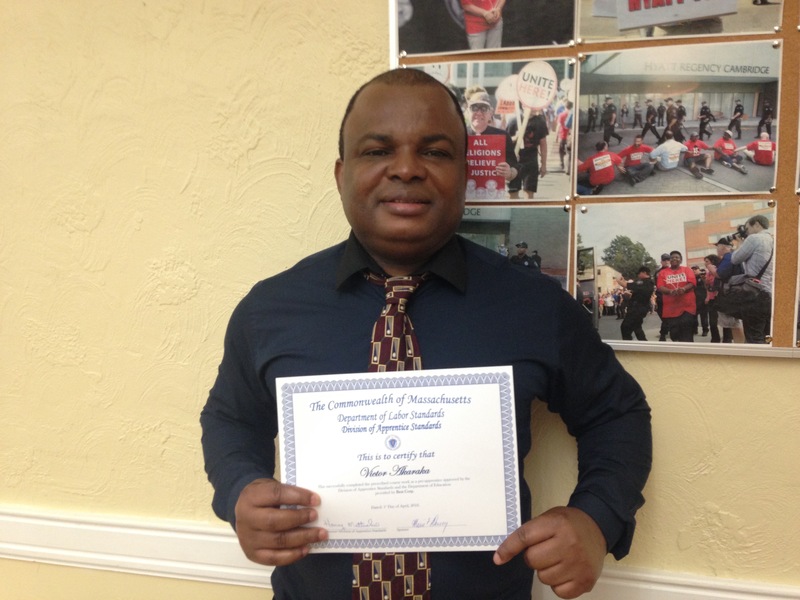 Graduate Victor Akaraka, 36, is looking to the hospitality industry to forge his future in the United States. A refugee from Zimbabwe, Akaraka, 36, arrived in the country seven months ago. BEST Corp staff not only taught him the finer points of room presentation, but also introduced him to critical American cultural norms. Akaraka said that in Zimbabwe excessive smiling, for example, is considered impolite because it indicates a lack of seriousness on the listener’s part; similarly, looking elders in the eye shows a lack of deference. As a new inductee to American customer service, though, Akaraka is focusing on his smiling and eye contact. Cannily, Akaraka has applied himself in a rapidly growing industry. Boston’s current supply of hotel stock is 52,117 rooms, and according to research firm STR Inc., another 2,160 rooms are currently under construction and 11,000 more are being planned. Since Best Corp started offering housekeeping training in 2008, 90 percent of program participants have found employment. At the time of their graduation ceremony, 14 of the 17 graduates of the pre-apprenticeship program had received either job offers or invitations to apply. Nicole Bowes already has an appointment with her BEST Corp career coach and a BEST Corp job fair coming up on Wednesday.